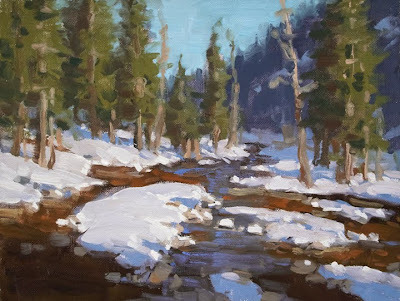 There is nothing I love more than going out on a beautiful sunny, snowy day to paint. And this week I can't seem to get enough of trying to paint this creek. Today I braved the slippery wet rocks to get a view from the middle of the streambed. This study is my favorite one so far; I am not tired of trying this subject matter yet. There is another view I want to try, but I haven't found the right lighting conditions for it yet; maybe tomorrow. I arose before dawn today and it was crystal clear, but quickly the ground fog moved in and it became as thick as pea soup, and seems to be lingering all day in the valley. You can practically watch the hoar frost form on the trees; flocking everything, including the downy winter coats on the livestock, into barely discernable tints of color. It was tempting to try a fog scene, but since the weather looks like it is going to become overcast soon, I thought I'd drive up above the fog to paint the creek again. Study 6x8" oil on linen.